Ever had a blowout at a three figure speed that delivered a smokescreen more effective than a certain Mr Bond’s DB5? Ever been in “control” of a car wandering over a lane and a half with everything behind you in a pea souper effectively playing battleships? Ever changed a tyre on the hard shoulder “track” side fighting against factory torque settings sure in the knowledge that your Paul Smith’s did not provide best purchase on the tarmacadam as the HGV’s thundered past, hammer down? And ever wondered what really could have happened if your 4 wheels of choice had not been engineered from scratch far beyond the realms of your own less than genius limits? Don’t even think about it. Trust me; I would not have written this. So take your tyres seriously: even a certain 6 month old, mid-engined German roadster on near new tyres (optional 17”s) at correct pressures was not immune to incident – in this case a screw on the road that punctured the tread and completely destroyed the sidewall in the resultant, somewhat rapid decompression. If brown ever was the new black, blame me. So what chance a car on worn tyres at incorrect pressures? Whenever collecting a trade car from a dealer we check the tyres, and the pressures are always wrong; amazingly sometimes over inflated. Tyres are the medium through which your car steers, brakes and grips, and manufacturers set pressures - that normally differ front to rear - to achieve the handling and ride compromise that your car has been set up for: make sure you keep it that way. Forget the old foot pump - most petrol stations have air machines that you “set and forget” until the correct pressure has been reached; all of 50p and 5 minutes total investment – you know you’re worth it. You will find correct settings in your car’s handbook, and often on a sticker inside the petrol flap or the door shut. These numbers will normally be shown as both “psi” (pounds per square inch) and “bar” (don’t ask): do not confuse them - 2 bar = 29 psi. And do not make do with a visual/kicking check; modern low profile tyres render this the most obsolete of old school Arthur Daleyism. Aside from pressures, you need to check a few other things: measure the “tread” (the bit that makes contact with the road) for depth – the legal limit is 1.6mm but the general consensus is not to go too far below 3mm before replacing. This is a standard for all Porsche and BMW approved used cars amongst others. The legalese goes thus: “at least 1.6mm throughout a continuous band in the centre 3/4 of the tread and around the entire circumference”. 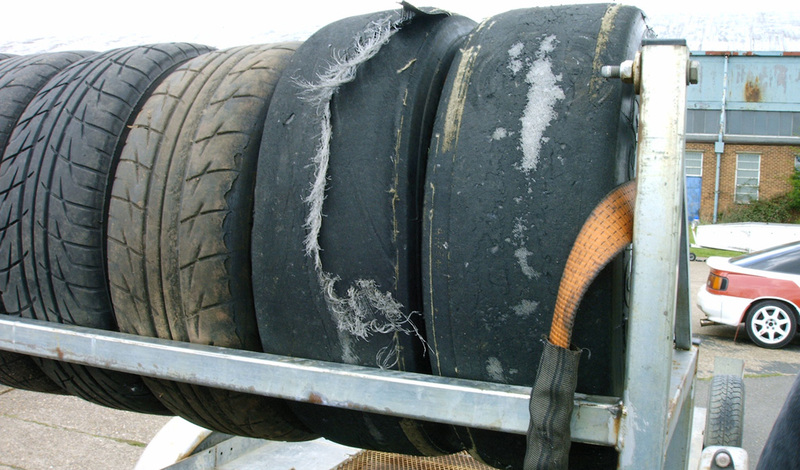 So if your tyre is shiny between the middle and inside or outside “shoulder” please replace – or get an MoT spanking.Wear on the inner or outer edge indicates wheel imbalance or incorrect “tracking” (wheel alignment), and excessive wear down the centre of the tread probably points to over inflation. Bear in mind that the driven tyres will normally wear out first – it’s ok to swap them front to rear to even out wear (as long as they are the same size…). Be aware that some tyres are “directional” – check for an arrow like indicator - and must be fitted to one side of the car only. Check for bumps or cuts in the “sidewall” (literally the side of the tyre that sits on the wheel) as any noticeable protrusion represents a weak spot - ditto a cut that looks anything less than completely superficial - and another probable mot fail. So you think you might need new tyres? What to do? Rather than throw yourself at the mercy of the local tyre shop that will sell you a set of shock absorbers and a new exhaust at the first sign that you are not an F1 technician, empower yourself with a bit of knowledge: know your numbers. Robust interrogation of a tyre sidewall is all that is required to become a member of the black rubber intelligentsia. Check your sidewall and you will find a number along the lines of 225/50/R17 V. The first number will vary from around 135 to 345 and represents the width of the tread in millimeters (1 inch = 2.54cm or 25.4mm). The second number is the height of the sidewall expressed as a percentage of the tread width, typically between 30 and 80 (sometimes known as “aspect ratio”). This is the number your local pub expert is referring to when talking about “low profiles” – the lower the number, the lower the profile. And if you need to explain to him the benefits of a lower profile – and you probably will - it’s that a shallower sidewall distorts less in “turn in” to a corner promoting handling precision, albeit – normally - at the expense of ride comfort. Moving on, “R” stands for “radial”, which means the tyre rubber is reinforced in the direction the tyre rotates as opposed to across the tread (the alternative being crossply – ‘60’s technology at it’s finest). The next number is the inner diameter of the tyre in inches (typically 10-22; ie the size of your wheels) and the last letter is the speed rating – the “higher” the letter the more capable the tyre. Make a note of all this info and possibly a further letter and number combination that follows immediately and hit the phone. Where and what to buy? Well you don’t necessarily need to replace the tyres with the same make and type, but be aware that if your car is under manufacturer's warranty you will need to fit recommended boots, tho’ this should still typically give you a choice of 3-4 manufacturers. And if you did buy your car new or “approved used” get a quote from an independent supplier for the right tyres and go back to your dealer as a loyal customer and suggest that you might like to stay loyal and you WILL get a deal. Maybe not quite the same money but you might get a wash and vac into the bargain. Trust me – customers that do not query main dealer tyre prices are flagged up as whipping boys. But ultimately get the best deal with the company you are happiest with – main dealers don’t expect to sell too many tyres so your copybook will not beindelibly blotted. But do remember the wise words of a Peugeot service advisor who once told me in heartfelt melodrama: “at the end of the day sir…your brakes are your life”. And indeed they are, but without proper tyres the vice-like grip on your discs might as well be locking the wheels on Casey Jones’ last run. Be safe out there.